At Muscle People Physio functional training is a major part of the injury rehabilitation and prevention focus. Functional Training is a popular buzzword in the fitness industry thanks to programmes like CrossFit. In short, Functional Training is improving movements that directly translate into your everyday life or sport. It enhances the coordinated working relationship between the muscular and nervous systems. The brain thinks in terms of whole motions, not individual muscles. It’s exercise with a purpose. What’s the Functional Training Studio? We believe that Functional Training is vital in improving your recovery from an injury, even more so to prevent re-injury, and we also think it’s kind of fun! We’ve brought in some cool kit like the Pilates Reformer, an Incline Treadmill, Rip60s and the SurfSets. 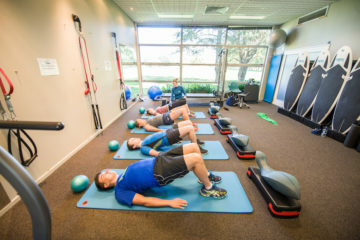 We will often include some time in the Functional Training Studio as part of your treatment. Some clients want to continue working with their physio after they have recovered and we are very happy to work with them. Some people want to work on Functional Training who aren’t injured but just want to improve their performance. We are able to develop and work with you on a tailored programme for whatever your goal may be. We also hold classes in our Functional Training Studio, like Dynamic Spines and SurfSet. How can I get some Functional Training? Just make an appointment with one of our physiotherapists and we can work together on a programme to achieve your goal, whatever that may be. Some people just like to have regular sessions using the Pilates Reformer, Rip60 and SurfSet, it can be as simple as that.